Check out our Facebook page for more photos from THE GIRL WHO! SCOTT GILMOUR & CLAIRE MCKENZIE make up Noisemaker, the award-winning writing partnership. 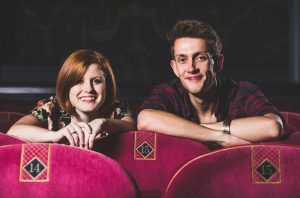 Both graduates of the Royal Conservatoire of Scotland, the pair work throughout the United Kingdom and internationally creating innovative, original work to challenge the expectations of musical theater. Noisemaker credits include My Left/Right Foot, a National Theatre of Scotland and Birds of Paradise co-production (Fringe First Winner and Herald Angel Winner 2018), Songs from the Seven Hills at the Sheffield Crucible, Ceilidh at Noise Opera, Glasgow (2018 European Championships), Atlantic at Edinburgh Festival Fringe, AMTP and Royal Conservatoire of Scotland co-production (Herald Angel Award Winner 2017), Little Red and the Wolf at Dundee Rep Theatre (Nominated for U.K. Theatre Awards and Critics’ Awards for Theatre in Scotland 2016), The Lion, The Witch and the Wardrobe at Royal Lyceum, Edinburgh, Forest Boy at New York Music Theatre Festival, The Other Palace, London and Edinburgh Fringe (S and S Award and New York Musical Festival 2016 Publishing Award) and Freakshow at The Roundhouse and The Arches (Scottish Daily Mail Drama Award 2012).